Delight your taste buds on this small-group wine-tasting tour from Montreal to Quebec wine country. Choose either the afternoon tour or the full-day tour, and receive royal treatment as you are welcomed by vineyard owners and led on exclusive winery tours at two or three wineries. Start with an educational wine-tasting workshop to learn how to identify flavours and then enjoy a blind-tasting experience. The full-day tour includes a gourmet lunch. The half-day includes a small food pairing session composed of artisanal products. This small-group tour ensures a welcoming and personalized experience with a bilingual English- and French-speaking guide. After meeting your guide, board the minibus for the one-hour drive to Quebec’s vineyard-covered countryside. On the way, admire the enchanting landscapes of Montreal’s south shore while your guide explains the basics of Quebec wine. Head first to the first winery, located on a hillside with an amazing view. Explore the vineyard on a guided walk before touring the winemaking installations and laboratory and taking a lesson on wine tasting basics followed by a blind tasting experience with the winery owner. Head to your second wine estate and enjoy a delicious European lunch with and a glass of sparkling wine. Then enjoy a full tasting of Chateau de cartes’ wines and ciders, followed by some leisure time to relax. A short drive will then take you to your last estate, where you will learn about winemaking techniques and have another wine tasting. Head to your first winery, located on gorgeous Rougemont hillside, where you’ll be taken on a guided tour of the estate. 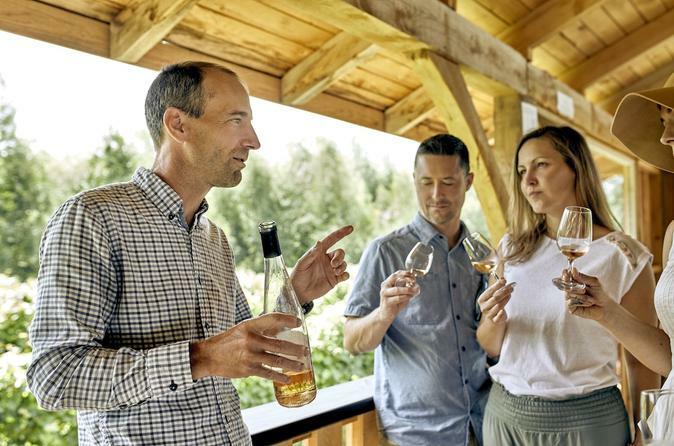 Learn about the culture of vines in Quebec’s challenging climate, then enjoy a tasting of exclusive wines and ciders paired with a local cheese tasting. Enjoy the drive to your second stop, a small family-owned winery located on the side of Mont-St-Hilaire with a breathtaking view. The vineyard owner will welcome you and tell you about the estate and its history and take you on a visit to the winemaking facilities and hear about their special techniques.